The Eatery. The Eatery copyright Massive Health Inc.
10 Free Fitness Sharing Apps for iPhone & Android. If you're looking to eat healthier or lose weight, tracking the food you eat is crucial. But how to do it? Some people use food diaries that they keep in notebooks. Others may use spreadsheets or custom-made forms. If you own an iOS device, though, there are many apps that let you track your food intake. 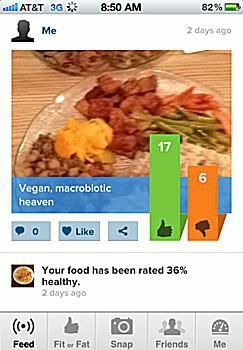 The Eatery app not only does this, but also adds the wisdom of other users to give you a rating on the healthiness of your meals. In many ways, The Eatery is an effective meal-tracking app, but as is true of many crowdsourced tools, it's only as helpful as its users. The Eatery works using two very basic functions. First, take a photo of every meal you eat using the iPhone or iPod touch's built-in digital camera. Then add an optional note about the meal and then rate it on a scale from fit to fat. Each meal, with your rating, is added to your feed. When you add a new photo to your feed, you're also shown photos snapped by other users and asked to rate their meals. Meals are shown anonymously (you won't see the name of the person whose meal you're rating; you don't have to be too worried about someone you know finding out you ate Belgian waffles for dinner — again) and you can skip photos if you don't know how nutritious a meal is or can't figure out what the photo shows. Just as you rate others' meals based on their photos, your photos are shown to other users who rate them. As time passes after your meal, more and more users rate your meal, giving you a rough, user-driven sense of how well or badly you're eating. In my experience, it's fairly common to draw 15-30 ratings for a meal over a day or two, so you're getting a pretty solid cross-section of opinion. Using those crowdsourced ratings for each meal, The Eatery then compiles a composite score for how healthy you're eating every week, using a 0 (unhealthy) to 100 (very healthy) scale. With your meal history available at any time, it's easy to get a real idea of exactly what you've been eating and identify trouble spots. For instance, my meals are extremely healthy, but my snacks are much more mixed, so I know that trying to improve the health of my snacks can improve the overall quality of my nutrition. It also makes it easier to discover that what might seem like an occasional candy bar is actually three a week — a big problem if you're trying to lose weight. Another interesting aspect of using the app is that, when you know that other people will see and rate your meals, you tend to want to eat healthier foods. No one wants to draw a negative rating. This gamification or mild peer coercion can be a big help in getting you to eat better. Those are the strengths of The Eatery, but it has its weaknesses, which lie in the thing that most often causes diets to fail: people themselves. Since the app has its users — regular people — rate each other's meals, the ratings are only as good as the nutrition knowledge of the people doing the rating. And, if the rates of obesity and diabetes in the U.S. are any indication, the nutrition knowledge of the average America is a bit low (putting it charitably). How else to explain that healthy meals like a lentil and quinoa salad would draw unhealthy ratings? All things considered, the users on the whole are likely to rate food correctly. That lentil-quinoa salad ended up with 10+ more positive ratings than negative ones, but the negatives still distorted the overall rating. Luckily, a fair proportion of users seem to be outside the U.S., so the different diets of other countries may help balance out some of the unhealthiness or lack of knowledge among some U.S. users. The other drawback I found in The Eatery also results from the app depending so heavily on crowdsourcing. The crowd can be wise, but it generally can't be expert. Knowing that your food is unhealthy can be useful, but only if you already understand something about nutrition. If you don't know what you don't know, finding out that a meal wasn't that healthy can leave you stuck. You know it was bad, but you don't know why or how you could change it to make it more healthy. This is where expertise could be valuable. If the developers of The Eatery could find a way to not only rate our meals, but also give us guidance based on those ratings, the app would truly create a virtuous pairing. If you want to get a handle on your nutrition, The Eatery can be a powerful tool. It won't necessarily tell you what to eat, but it will help you identify patterns in your meals and snacks, track your food, and get a sense of how healthy other people think it is. When it comes to eating well and losing weight, understanding what you're putting in your body is a major factor. An iPhone, iPod touch, or iPad running iOS 4.2 or higher.